High quality single items with no minimum number required. 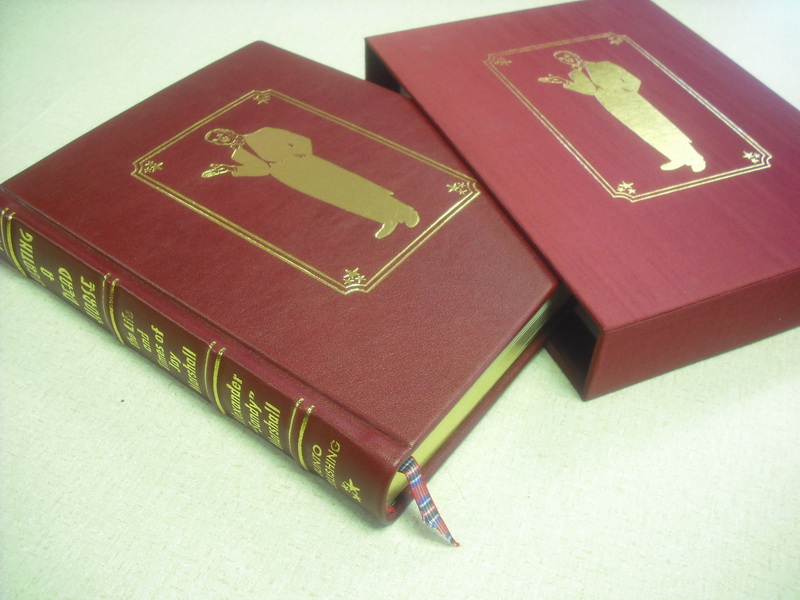 We will hardcover bind your one-of-a-kind book or use our skills to create that special item! Grimm Book Bindery has been binding for individuals like you since before the Civil War. Please see below for the many options and solutions we can provide for your individual needs. If you can imagine it, we can create it! Personalized Guest Books: Made to order for weddings, anniversaries, grand openings, cottages, funerals or your special event! Pages are in a soft cream color measuring 1 1/8″ x 10″. The title page is printed with headings and lines to accommodate any event including spaces for the occasion, the date and the location. The rest of the book contains 50 printed pages with headings for names & addresses of your guests, enough to accommodate up to 1250 guests! All of this is professionally bound in your individually designed cover. 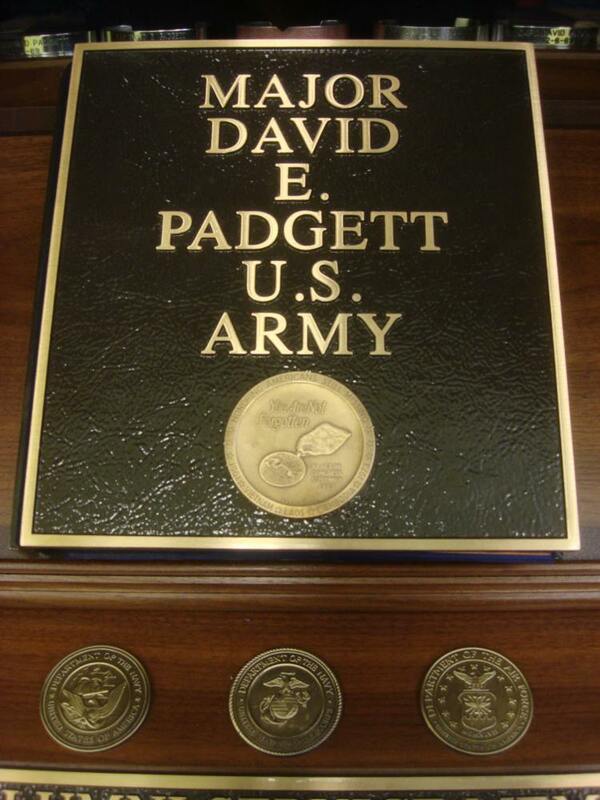 Standard covers are done in full leather or book cloth which is hot foil stamped in gold with your own words & dates. For a more unique piece, you can create covers using a color copy of your provided art or photo (which works great for Cottage Guest Books to have a full scene over the entire cover!) An option popular with brides is to use material from their wedding (a dress, veil or other material) for the cover material on the guest book. A frame to accept a photo can also be incorporated right into the front cover. Options abound for the creative mind! For easy ordering, fill out our Guest Book Order Form online and then send it as an attachment to an email for basic orders. If you want to send in material or photos to use, just print the form and send in with your materials. Typical binding time is just 2-3 days but can be done faster when needed for an additional charge. Personalized Blank Books or Journals: Blank books are perfect for gag gifts, recipes, diaries, poetry, private journals or as personalized novelties. Two stock sizes can be shipped within just 1-3 days – GREAT for holiday, birthday, new baby, wedding or retirement gifts! You can also custom make them by determining size, number of pages and cover (as described above for the Guest Books). Custom lettering is included in the price of all – you make up a title and we’ll print it on the cover! We also have options for a full color printed cover printed directly on a white cloth for an elegant look or laminated for a high gloss finish. Click to go to the Novelty Orders page. Handmade Journals: Each one is an individual piece of art. The covers are made from specialized marbled or handmade papers from various artists. Some have cloth, or 1/2 or 3/4 leather added for a more formal look. The inside pages are unlined to allow for personal expression and are also acid free to give a longer life to the heartfelt words that will someday grace the pages. You can view the journals in our photo gallery here. Otherwise, if interested, just send an email to info@grimmbindery.com and we’ll email you back with pictures and pricing of the current Handmade Journals in stock. Create Young Authors Bookmaking Kits: A pre-printed pack of pages which contain materials necessary along with instructions to guide the young author to write and illustrate their very own hardcover book. The kit is appropriate for children aged 4-14 (younger children will need guidance). The supplied pages can be hand printed or fed through a computer printer for a more traditional look. 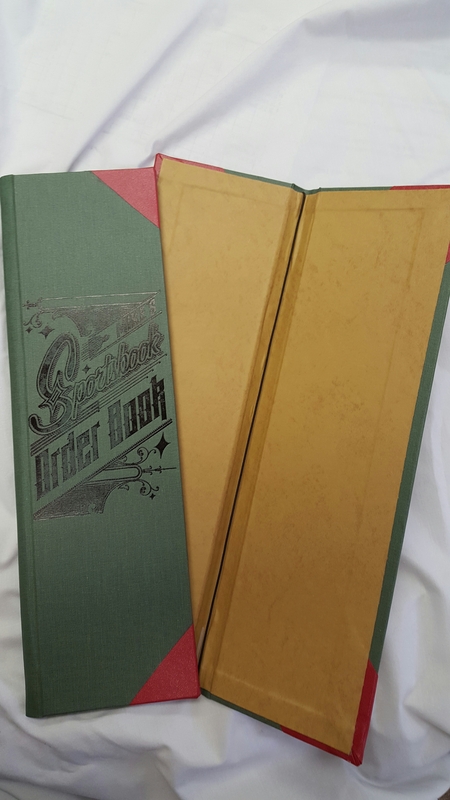 Once complete, the pages are returned to the bindery in the provided envelope for their very own hardcover binding, which is included in the price! There are also options available to make additional copies for grandparents and others. Click here to order or get more information. Chicago Post Binders & Photo Albums: You supply the paper or inside pages and we’ll create the cover for you. Chicago Posts & Screws allow you to add & remove pages as needed. Cover can be hot foil embossed with your title, indicating the dates & event the binder is covering. Great for weddings, vacations, school days or the like. We can also punch or drill the holes in your paper. Sizes available up to 24″ x 36″ in book cloth, full color glossy covers or in imitation or genuine leather. You can also provide the cover material for a unique look! Stop at the local fabric store, send some hand made papers or tie dye some cloth, let your imagination come up with something all your own. For easy ordering, fill out our Miscellaneous Item Order Form 96.23 Kb online and then send it as an attachment to an email for basic orders, if you want to send in material or photos to use, just print the form and send in with your materials. You can also just tell us the page size and where you want the holes punched and we can make & ship the post binder without having to send us the pages. Slip Cases, Portfolios & Drop Spine Boxes: Grimm Book Bindery has been creating that one of a kind portfolio for art students for years. 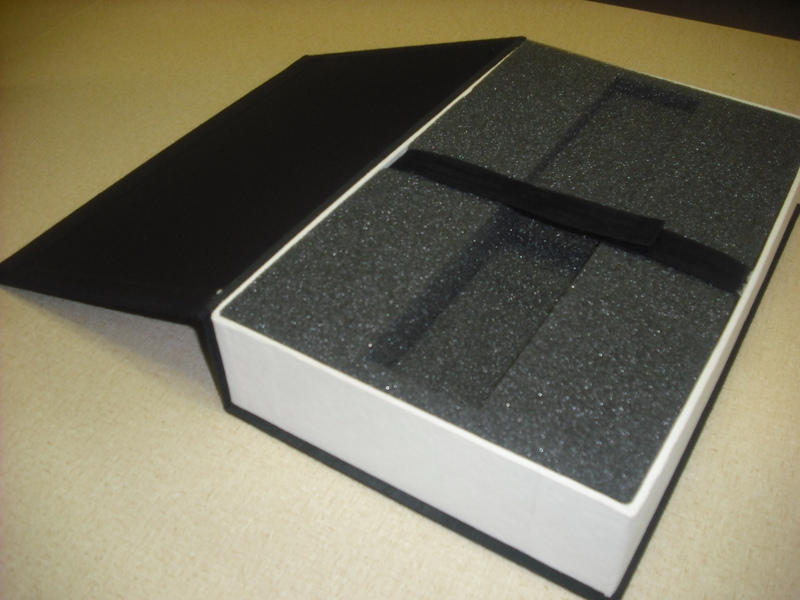 We also create Slip Cases to house a multiple volume set or even for your single volumes when you would like more protection. Drop Spine Boxes (also known as “clam shell”) are a good solution for older books to protect them from exposure to the environment in your home, office or library. We’ve used creative pieces of sheet metal, specially cut plastics and other materials to create pieces envisioned by the serious art student or professional. Our customers make a big impact when showing their work to prospective clients or employers. Write up a design of what you envision and our experienced team will find a way to make it!